The Britt Godwin Country Show! 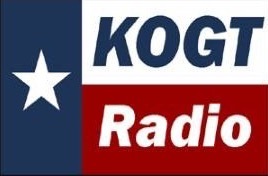 Tune in Every Wednesday from 4 to 7 P.M. CST on AM 1600 KOGT to hear Orange's very own Britt Godwin playing all your favorite Classic Country Music! During the show each week, Britt also features local musicians and history making songwriters such as Dean Dillon, Aaron Barker, Rebecca Lynn Howard, Mark Nesler, and B.B. & Co.'s very own Grammy Award Winning Don Rollins and The Living Legend Huey Buxton. Nowhere else in the country can you find an Old Fashion, Traditional Country Music Show like this! And what's better, We've got a Triple Threat for Ya! THREE GREAT WAYS TO LISTEN!!! WRITE IN AND LET US KNOW WHERE YOU'RE LISTENING FROM EACH WEEK!!! Facebook connects us to people all the time, and now it can connect you to the Britt Godwin Country Show LIVE each week! Just CLICK THE KOGT FLAG to go straight to our Facebook page and let us know where you're listening from. And you never know, Britt may give you Shout Out LIVE on Air!